So to ride the waves of affect is what Massumi invites us to do, not in a straightforward collection of static essays, but in a process form reflected in this new book through a series of interviews. He notes that the interviews are not “mere” dialogues where the interlocutor is defined as questioner. Instead they are encounters in which interlocutors are accomplices in thought. These are often carried out as part of or against the background of ongoing collaborative work between Massumi and interviewees, many of which took place in SenseLab at Concordia University in Montreal. Massumi has been an active participant in this laboratory for “research-creation” which operates “transversally” between philosophy, creative practice and activism for many years. Extending from the idea of process philosophy, these interviews are processual and collaborative explorations of the relationship between affect and politics as a process of continuous transformation and becoming, not as fixed forms. Change is what is primary to affect and this is what makes it immediately political. 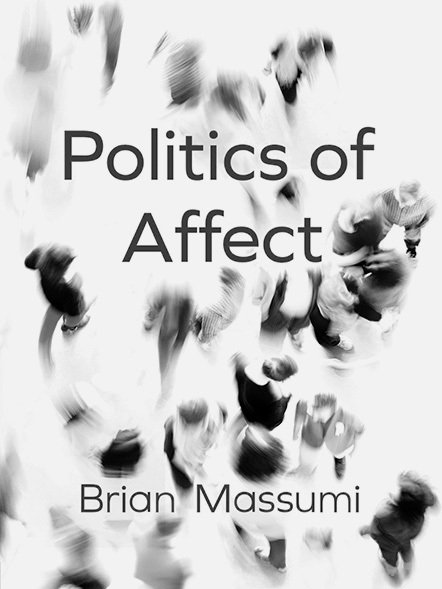 The need for patience with respect to “return activity” resulting from the exploration of affect (and its relationship with politics) doesn’t imply that we cannot bring some more clarity into how exactly Massumi understands affect. Massumi’s ideas about affect as a concept and his deploying of the term in various domains of human experience have not changed fundamentally since he published the paper he is likely most known for, “The Autonomy of Affect” in 2002. In this text he understands “affect” as “intensity,” indicating non-conscious and unnamed, but nevertheless registered experiences of bodily energy and intensity that arise in response to stimuli impinging on the body. Here affect refers to the body responding to stimuli before they are cognitively processed and consciously registered. Cognitive processing takes time – a certain lapse occurs between the event and its conscious registering. Countless laboratory experiments by cognitive psychologists and neuroscientists have demonstrated this lapse which lasts an average of 0.5 seconds. That we do not register it is simply due to the fact that we are constantly immersed in a continuous flow of stimuli and therefore do not register any delay or rupture. The fascinating find in these laboratory experiments has been that while the cognitive system requires its 0.5 to even 0.8 seconds of processing time, the body itself responds much quicker – within a time frame of 0.2 to 0.3 seconds. Averaged at 0.25 seconds, this implies that affect moves at roughly twice the speed of consciousness. It is clear to see then how this puts consciousness on unstable and unequal footing with affect. It does not imply, however, that the cognitive system is not able to influence the affect/intensity level. Language, as the ultimate expression of human consciousness par excellence, is not simply in opposition to affect, according to Massumi, but operates differentially to it: some forms of language can actually amplify affect (generic and rhythmical but semantically void “political” slogans for instance), while other forms of language can dampen affect (deliberative political analysis for instance). Affect, furthermore, is radically synaesthetic. It operates across all the senses. And across all these sensuous registers it can also be influenced, differentially. Affect can then be understood as a non-conscious bodily intensity that cannot be named but only be felt. Yet is suspect to intense forms of manipulation that can be (and often are) highly deliberate in their operation. They range from advertisement campaigns and viral marketing to political propaganda and techno-somatic agit-prop. However, because of its speed and pre-cognitive status, affect retains a certain autonomy from such forms of manipulation. The capture and closure of affect is, notes Massumi, necessarily an expression of the fact that “something has always and again escaped.”2 What is left behind, what has escaped, is an “autonomic remainder,” a potential that can build up over time and constitutes the vitality of life itself, without which no development, no evolution and no change would be possible. The relationship of affect to politics is thus as differential as its relationship to language and consciousness. This then is also the way into reading and understanding this book. The interviews it contains are all particular explorations of the differential relations that exist between affect and politics. A few selections follow. In “Navigating movements,” an exchange with Australian author, philosopher, filmmaker and playwright Mary Zournazi, the first question at stake is “manoeuvrability” – where we might be able to go and what we might be able to do in the field of affect and politics. Zournazi concludes the exchange by asking Massumi how the relationship between ethics, hope and the idea of joy might be conceived, extending from Spinoza’s and Nietzsche’s musings on the subject. “Microperception and micropolitics” entails a conversation with Joel McKim, Lecturer in Media and Cultural Studies at Birkbeck College in London. The primary question addressed is toward the capacitation of the body to register interruptions (microperceptions) often related to the effect of shock and only registered as an “effect” that can translate into other forms of the political. McKim invites Massumi to explain how this moment of interruption worked in the context of the SenseLab project in Montreal, which Massumi provides an insightful account of in terms of how it worked in such a specific, situated project. The exploration of affect in “Affective attunement” illuminates how we can analyze and understand our “being in the crowd” differently, and to no surprise “differentially,” “in the field of catastrophe.” This conversation, with Erin Manning, Director of SenseLab, is set against the backdrop of an article by Massumi published in The Guardian on 15 April 2011 in response to the Fukushima nuclear disaster. “Immediation,” again an exchange with Manning, draws attention more specifically to the event as the primary unit of the real, which however does not exclude the past from this moment of immediation. And in “What a body can do” capacities for decision making and problem solving by “bodies without brains” are explored that are traditionally ascribed to “thinking.” This dialogue involves Austrian philosopher Arno Boehler who has sought out the immediate connection of philosophy and the body (the somatic) by founding a philosophy performance festival in Vienna called Philosophy on Stage. All of these interviews / conversations / exchanges are different ways of navigating the complex realms opened up by this indeed deceptively simple Spinozian formula of “the power to affect and be affected” in the overlapping domains of affect and politics. Massumi very aptly concludes his book not with a conclusion but with a brief consideration of some of the most prominent missed conceptions of affect. It would seem it is easier to say what affect is not than what it might be. 1. Brian Massumi, “The Autonomy of Affect”, in Parables for the Virtual: Movement, Affect, Sensation (Durham, North Carolina: Duke University Press, 2002), p. 30.